Versioning in ODI is a less covered topic. Lets look today at how ODI handles object versioning. If you recall from the ODI repository architecture diagrams, ODI stores Topology, Security and Versioning information in the Master Repository. Each time an ODI object (Project, Model, Datastore, etc) is versioned, it is saved in the Master Repository. We can save the contents of SNP_DATA.DATA_CONTENTS into an Operating System file named as pkg_odi_process.Z, though we can name it whatever we wish with a .Z extension. Uncompress this file using Unix uncompress or Windows Winzip, WinRar. The file that you get by uncompressing, should be given a .xml extension. 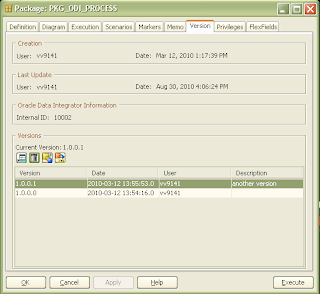 The resulting pkg_odi_process.xml file is the same file as if we would had exported the package PKG_ODI_PROCESS using Export command in the Designer module into an XML file. This file can be used to import back to the Work Repository. Nice Post. Helped me understand about snp_data table.